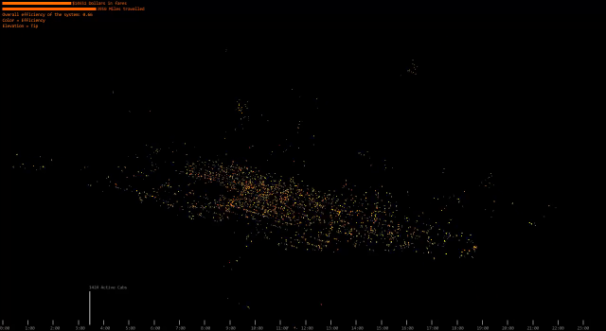 A new data visualization video shows a day in the traffic life of New York City using the location data of 100,000 NYC cab rides. The project, called Taxi!, is the work of Tom McKeogh, Eliza Montgomery and Juan Francisco Saldarriaga, who created it for a course at Columbia University. Taxi! was created using publicly available NYC taxi data--along with some help from the Google Maps API--to make sure the cars travelled correctly. The artists call the project a “breathing” map of the city in the project’s description, due to the way that the cities traffic swells and ebbs throughout the day. Interestingly, despite the fact that it just maps the data on a plain black background, Taxi! actually forms a reasonably accurate map of New York: It clearly shows the outline of Manhattan, along with the major thoroughfares of the outer boroughs. Even more amazingly, the project uses only a small selection of the taxi traffic in NYC, limiting itself to just rides that began or ended in either Lincoln Center or Bryant Park. For more on the project, you can check out Saldarriaga’s site, where he also has descriptions and videos for other interesting NYC-based visualization experiments.